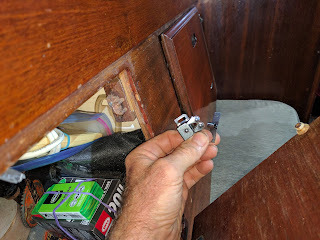 I want to keep adding media from over the past 3 weeks especially about Cuba but in the meantime, I have a list a mile long of boat chores. I got tired of adding bungy cords to all my cupboard doors before setting sail so I found a door latch at Home Depot that I can use instead. They are not stainless steel but neither are the original ones that have lasted over 40 years. I thought I would add some photos today of Cuba that I took on the streets of old Havana last Sunday. The first one shows Kurt so you can see how incredible this place is. I have not altered or cropped any of these shots that I took with my Canon sx40 in auto mode. Some of these scenes are so amazing.